Hollywood has offered up few Asian American stars. But one of its most well-known is a cartoon: Apu from "The Simpsons." Apu Nahasapeemapetilon, the Indian American character who operates the Kwik-E-Mart convenience store in the fictional town of Springfield and is known for the catch phrase "thank you, come again," has served as the animated series' running immigrant punchline for almost 30 years. "What bothered me about Apu is how he stood in for my parents, replacing their real stories and real struggles and their really complicated lives with an accent," said comedian Hari Kondabolu in his documentary "The Problem with Apu," which airs Sunday on truTV. Since there were so few Indian Americans represented in the media, it was an impression that stuck. "If that's the way (people) know or understand your community, that's what they are going to look for," said Shilpa Dave, assistant professor of Media Studies at the University of Virginia and author of Indian Accents: Brown Voice and Racial Performance in American Television and Film. Even though Asian Americans are one of the fastest growing ethnic groups in the U.S. -- and one of the wealthiest -- they are often overlooked by marketers, advertisers and the media. 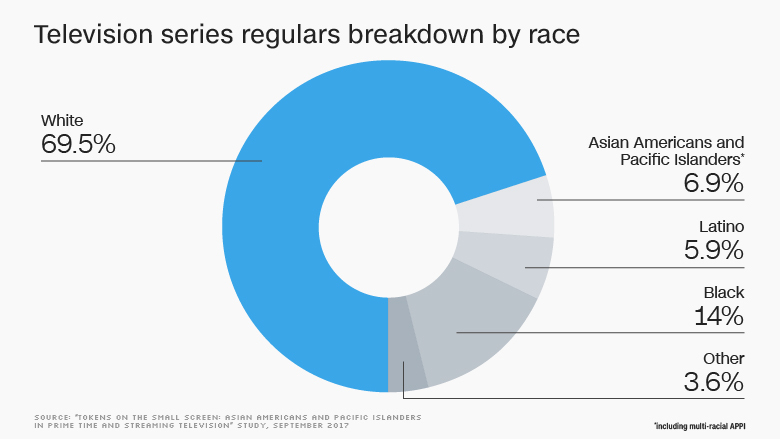 A recently released study by researchers from several California universities found that Asian Americans and Pacific Islanders (AAPIs) were the most underrepresented racial group on television during the 2015-2016 season. Of the 242 shows the researchers reviewed, 155 (or 64%) had no Asian American or Pacific Islander regulars. 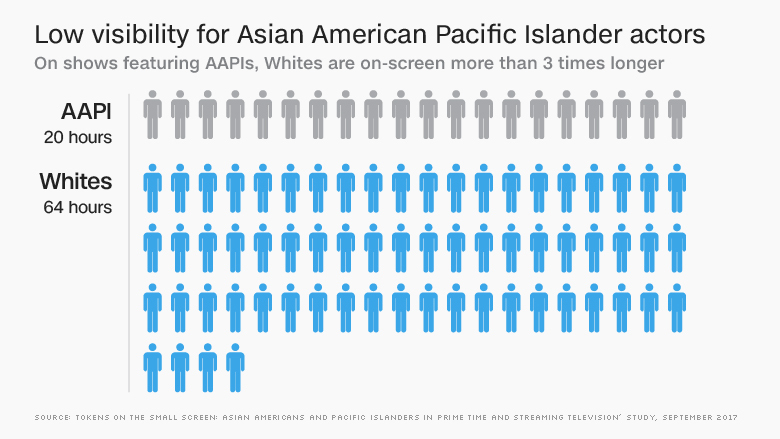 "Regardless of the viewing platform, audiences may never see an AAPI regular on-screen, effectively erasing the AAPI population from a large portion of the television landscape," the study found. Even when there was an Asian American or Pacific Islander regular on a show, the researchers found they often got less screen time than their white counterparts and their roles often fit into a series of racial stereotypes. Jennifer Lee, a professor of sociology at Columbia University said Asians are often typecast as either high achieving model minorities or as service workers. "Of course, there are Asian American cab drivers, Asian American deli owners, and there are Asian American scientists," she said. "But there are also Asian American journalists, there are Asian American professors ... we're just more multifaceted, especially with the second generation." Some Asian American actors are helping to break new ground and get more air time. Writer, comedian and actress Mindy Kaling, for example, created and stars in The Mindy Project, where she plays a successful obstetrician/gynecologist. Aziz Ansari's show Master of None recently won an Emmy. And the critically acclaimed series Fresh Off the Boat is the first sitcom to feature an all Asian-American family on prime time television since the 1990s. With a population of 20.5 million in the United States, Asian Americans are the fastest growing ethnic group in the nation -- and they wield a lot of financial power. Currently, representing 6% of America's population, Asian Americans are on track to surpass Hispanics as the largest immigrant group in the U.S. by 2055, according to the U.S. Census Bureau. Collectively, Asian Americans represent $825 billion in purchasing power -- which is "slightly larger than the economies of all but 17 countries worldwide, and slightly larger than the gross domestic product (GDP) of Turkey," according to a 2016 Nielsen report on the expanding footprint of Asian Americans in the U.S.
And across the broad spectrum of ethnicities that comprise the Asian American population in the U.S., the median household income is $77,000. That's more than the median household income of whites at $61,000 and nearly twice that of blacks at $36,000 and Hispanics at $44,800, according to Pew Research Center. "Asian Americans have enormous purchasing power," said Lee. 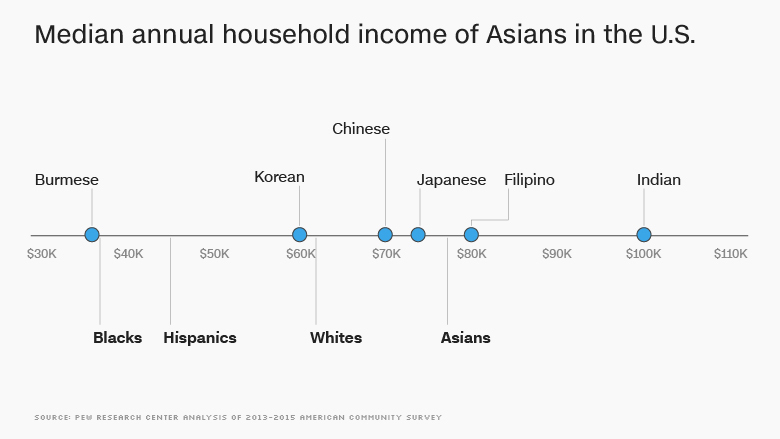 "Asian Americans are also accumulating wealth. They are also creating businesses." Yet, Asian Americans are virtually forgotten by marketers, advertisers and the media. The challenge is convincing companies to see Asian Americans as consumers to go after -- ones that will bring them plenty of profits. "When you speak to (executives) about the numbers in a language they can understand, they're like 'wow,'" said Bill Imada, chairman and chief connectivity officer of the IW Group, an advertising and PR agency that specializes in helping companies and brands reach communities. It's something that Kondabolu knows all too well. "We have to prove that we are capable of making people money. And once you prove that, then they are interested. But they won't take the risk. All these things involve some degree of risk," Kondabolu said. "Increasing diversity isn't out of a sense of justice or righteousness. It has to do with at the end of the day - this is going to make us money. I think there's still a degree of 'How can I prove this is a sound investment?'"